While Warner Bros. and DC’s Justice League is not hitting theatres until mid-November, one clear stand-out from the movie’s trailers has come from an unlikely source. One would think Batman, the Dark Knight himself, would emerge as the front-runner that everyone is clamouring to see. Or Wonder Woman; the Amazonian Princess, whose self-titled debut film has been the runaway hit of the summer. But it’s not her either. The Flash? It has to be the Flash. The hit CW television show (albeit with a different actor playing Barry Allen) would surely be enough to garner most of the attention. The superhero everyone is apparently dying to see is the King of the Seven Seas himself: Aquaman. Strange when one considers that in the history of all the Justice League’s champions, he’s one of the most maligned, most made-fun-of, and laughable. 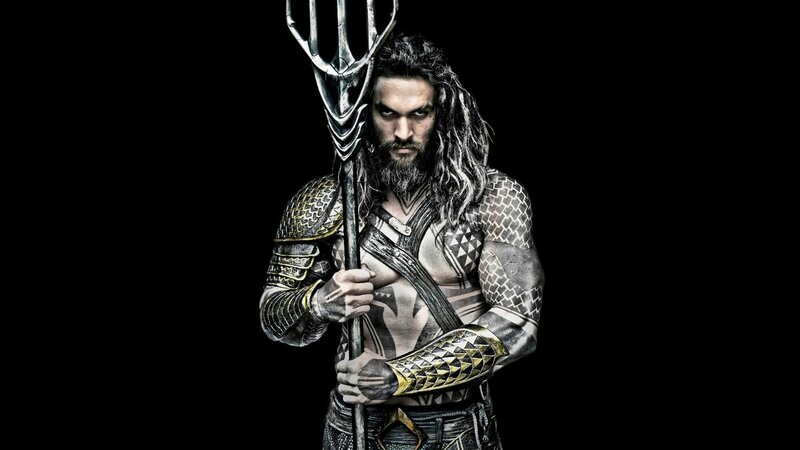 Zack Snyder, another individual much maligned by film critics and a sect of comic book movie fans, set this new Aquaman revolution into play when he decided upon an odd casting choice for the Marine Marvel in Justice League. Jason Momoa, the muscle-bound behemoth from HBO’s Game of Thrones, will be playing Arthur Curry aka Aquaman. When you look at Momoa, with his towering figure and long dark hair and beard, you never think Aquaman. 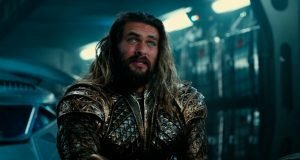 The Aquaman DC fans are accustomed to is a clean cut, golden-haired Atlantean. Chiselled yes—but not a beast. Momoa is truly a monster and is set to change the pop culture dialogue surrounding Aquaman forever. Aquaman first appeared in More Fun Comics #73 in 1941. Slowly, but Aquaman gained enough momentum to be given his own self-titled comic series early in 1962. It wasn’t until the 1970s that Aquaman became a household name—for North American children anyway. 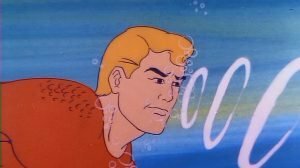 ABC’s Saturday morning cartoon Super Friends was essentially the Justice League of America with a few bizarre sidekicks; and a full, card-carrying member of the JLA was Aquaman. From the cartoon, the Dweller of the Depths became well known for his recognizable orange top, dark green leotards and the famous echo sound he used to talk with sea creatures. While the blonde haired, blue-eyed Adonis of the Deep was likeable enough, he still was a second-tier superhero, placed well behind Superman, Batman and Robin, Wonder Woman, and Green Lantern. However, Aquaman took a serious turn with the cartoon series Justice League in 2001. While not an everyday player, the Aquatic Ace showed up every once and a while, and he was far different than his representation in Super Friends. This Aquaman was brooding and angry—a far cry from his previous animated life hanging out with the Wonder Twins. Aquaman took another major shift when Geoff Johns began writing him in DC’s The New 52 in 2011. In the rebooted series, Johns made Arthur Curry a tortured man, twisted internally between his two loves: his duty to Atlantis and his connection to surface dwellers. Aquaman, being born of an Atlantean and human, is of mixed race. It’s the classic story of a character that essentially feels he has no home and doesn’t feel like he belongs to either of his peoples. The Aquaman in the Justice League movie we will see in a few short months appears to be bringing a whole new level of character revolution. 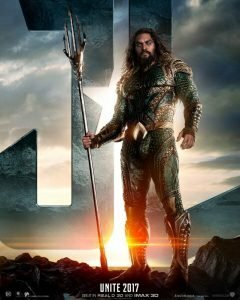 While the only evidence fans have thus far is a few images and a handful of movie trailers, it is clear that Aquaman has changed for the better. We are now potentially entering the era of Aquaman, dare I say, becoming cool. A year ago, that would have been a laughable statement, but this year’s San Diego Comic Con Justice League trailers have proved otherwise. Whether it’s Aquaman riding on the top of the Batmobile ready to leap and attack a pair of Parademons or surfing a Parademon through a five story building, then tossing his hair to the side like he’d just crushed a huge wave, Justice League could very well be Aquaman’s coming out party. This Aquaman acts and looks more like a guy who just came from carving some heavy waves or playing lead guitar in a metal band. And speaking of guitars, when Momoa was introduced at this year’s San Diego Comic Con for a little Aquaman talk and teaser (all before the Justice League panel), he used his trident as his air-guitar, all done to blaring rock music. Now that’s an Aquaman we can all get behind. This Water Wraith is set to be the breakout star of Justice League, and with his solo movie, Aquaman, shooting right now and set for a December 2018 release, there may be no limits for the heights he can reach. James Wan, the director of horror films like Saw, The Conjuring, and Insidious, will be manning the steering the Aquaman ship, and bringing in someone like Wan will only further the new revolutionary mythos of Aquaman—a character once maligned, and now on the precipice of being Warner Bros. and DC’s newest break-through commodity.